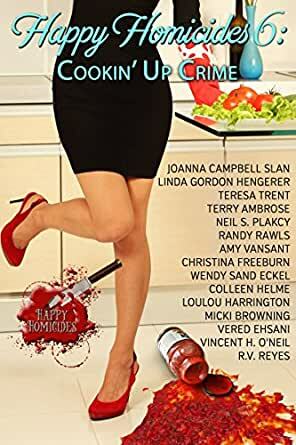 Happy Homicides 6: Cookin' Up Crime - Kindle edition by Joanna Campbell Slan, Linda Gordon Hengerer, Teresa Trent, Neil S. Plakcy, Randy Rawls, Amy Vansant, Christina Freeburn, Wendy Sand Eckel, Colleen Helme, Loulou Harrington, Terry Ambrose, Micki Browning, Vered Ehsani, Vincent H. O'Neil, R.V. Reyes. Mystery, Thriller & Suspense Kindle eBooks @ Amazon.com. Find Your New Favorite Author! Our biggest collection of seasonal cozy (traditional and clean) mysteries yet! Fifteen award-winning, multi-published, and bestselling authors share food fantasies with a fatal twist. And as always, the book comes with a special code so you can email for a FREE bonus file with recipes and craft ideas that go along with the stories. Included are Kiki Lowenstein and the Smoothie Operator by Joanna Campbell Slan; Dying for Spiced Tea: A Beach Tea Shop Short Story by Linda Gordon Hengerer; A Gift for Gus: A Pecan Bayou Mystery by Teresa Trent; Recipe For Murder: A Seaside Cove Bed & Breakfast Mystery by Terry Ambrose; Nectar of the Dogs: A Golden Mystery by Neil S. Plakcy; Irish Texas Chili Story: A Jonathan Boykin Short Story by Randy Rawls; Dot Didn’t Do it: A Pineapple Port Mini Mystery by Amy Vansant; Simmer to Death by Christina Freeburn; Food for Thought: A Rosalie Hart Mystery by Wendy Sand Eckel; Catering to Murder: A Shelby Nichols Adventure by Colleen Helme; Murder, Moonlight, and Muffins: A Myrtle Grove Garden Club Short Mystery by Loulou Harrington; F is for Fruitcake by Micki Browning; A Death in Customs: The Cozy Tea Shoppe Mystery Series by Vered Ehsani; Silent Harmonies by Vincent H. O’Neil; and Fish Fried by R. V. Reyes. 5.0 out of 5 starsFans of Vered Ehsani's Society of Paranormals and Cozy Tea Shoppe series shouldn't miss this one! Vered Ehsani offers us an addition the her Cozy Tea Shoppe series. This short story is quite typical of Ehsani's books featuring Beatrice Knight, which is to say, it is very entertaining and has a wonderful "take" on the supernatural. Nothing quite like it. Among my very favorite paranormal series. Fans won't want to miss this short story as it introduces, I believe, a new character that we will see more of and who is, of course, mysterious. I enjoyed reading this book filled with short stories! The best part for me, is that I have discovered new authors, and would love to read their books! Thanks for introducing them to me! You are all awesome! 4.0 out of 5 starsSomething for everyone. I love to read books by Colleen Helme, Joanna Campbell Slan, and Teresa Trent. There were a couple I could not get into, but overall I enjoyed the books and authors selected. At this price I had zero complaints. 5.0 out of 5 starsAnother great cozy mystery compilation! I love the Happy Homicides books! I've found more new favorite authors as always. I recommend this book to any cozy fan. 4.0 out of 5 starsA big winner, loved it! I had a wonderful visit with so many old friends and met a couple of new ones in Happy Homicides 6! Colleen Helme writes one of my top series so it was no surprise that I LOVED Shelby Nichols in Catering to Murder. It was an intriguing story as always and it included a nice "yum" encounter with Ramos!!! Joanna Campbell Slan always comes through with wonderful visits with Kiki Lowenstein and I was excited because I figured it out before Clancy announced who killed the husband of one of Kiki's customers. Of course that was near the end of the story. I truly enjoyed most of the stories and while the other two did not fit my tastes, they were well written and I finished both of them. Even if I hadn't gotten the book at the special preorder price, that math would have landed the anthology in the win column for me and you can never lose out pre-ordering Happy Homicides!! Every one of them has given me hours of fantastic reading. I'm not a fan of anthologies/short stories because there's very little opportunity for character or plot development so I mostly just read them to search for new authors to enjoy. That said, I have read all of Colleen Helme's books& like this story as much as her novels. It's nice catching up with "old friends" in between novels & she still managed maintain the humor she infuses in all books. I also will be reading Amy Vansant, & Randy Rawls since I also liked their stories. I love reading short stories All of them are enjoyable stories and I recommend this book to anyone who wants to read short stories.